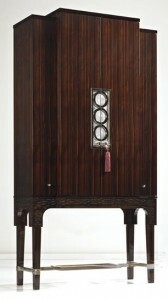 The drinks cabinet (above) I have been drooling over ever since I saw it in Vogue Living a few years ago (below) and posted about it here. Above image taken by Lisa Cohen for Vogue Living Australia, May/June 2005 issue. All other images courtesy of Matsuoka International. Last night, whilst browsing through back-issues of Belle magazine for something else unrelated, I finally found this apartment by Christian Lyon. 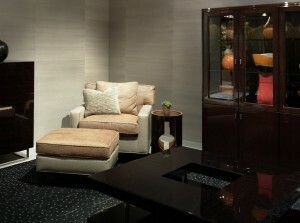 I’ve had it in my head since the last post I did about him – one of my favorite interior designers – almost a year ago. I promised to find some more images to share and now finally I can. Inspired by luxury ocean liners from the art deco era, Perth based Lyon has created a stunning home for his clients in this massive 3-story mansion (which happens to contain a bar, dance floor, squash courts, gym, saunas, and a 21-seat private cinema). Sourcing trips to Europe and the US have provided much of the furniture and accessories that make this home so different from almost any other in the country. 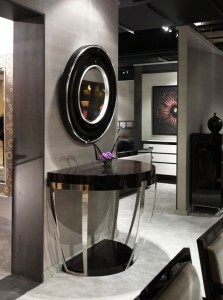 In true Lyon style, the furniture and colour palette simply oozes glamour. 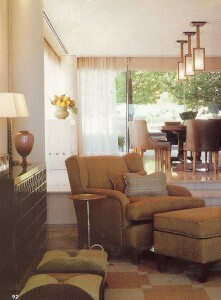 A Christian Lyon designed armchair sits next to a table by Nancy Corzine on top of which sits a Donghia lamp. A very pretty vignette. 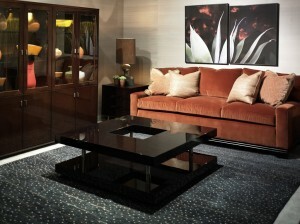 A mix of custom designed pieces in the living space. Apart from the acid green and cobalt blue curtains, the colours are very serene. I’m loving the stonework around the fireplace (to the left). 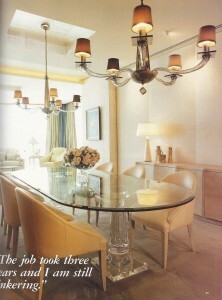 Chandeliers by Donghia in the dining room above a very glam crystal dining table. If that’s not fit for a hollywood starlet, then I don’t know what is! 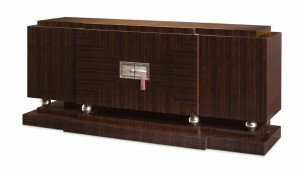 A close-up of the dining room sideboard, from Nancy Corzine. The lamp is from Alexandre Biaggi (a gorgeous store in Paris that you should definitely check out on your next visit), and goat-skin covered cocktail set. The article doesn’t mention it, but they look to me like they could be by Aldo Tura. Another seating area, looking out over the informal dining area. 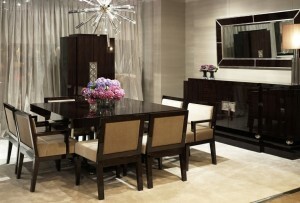 I wish I had the space for one dining area like this, let alone two! 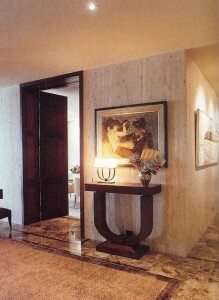 In the entrance, a deco era table and lamp with a 30’s leather carved bas relief. Love it. Love it all! 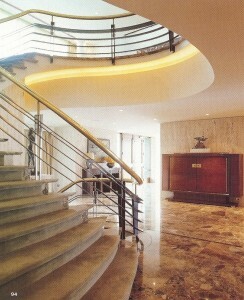 The ocean liner inspiration is evident here with the grand spiralled staircase. I just wish the talented Mr Lyon had a website so I could get my fix of his work more often. 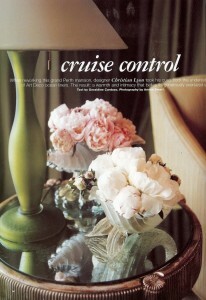 From Belle Australia December 2004, photography by Anson Smart. 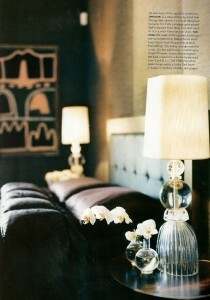 Christian Lyon is probably my favorite Australian interior designer, and one of my all time favorites. He is based in Perth, and his work features in Vogue Living (Australia) quite often. But unfortunately he doesn’t have a website with more images. He always creates glamorous, timeless and sumptuous interiors, with usually some sort of reference to the 30’s and 40’s (my favorite era). I’ll try and find some more to share. Hope you enjoy these! 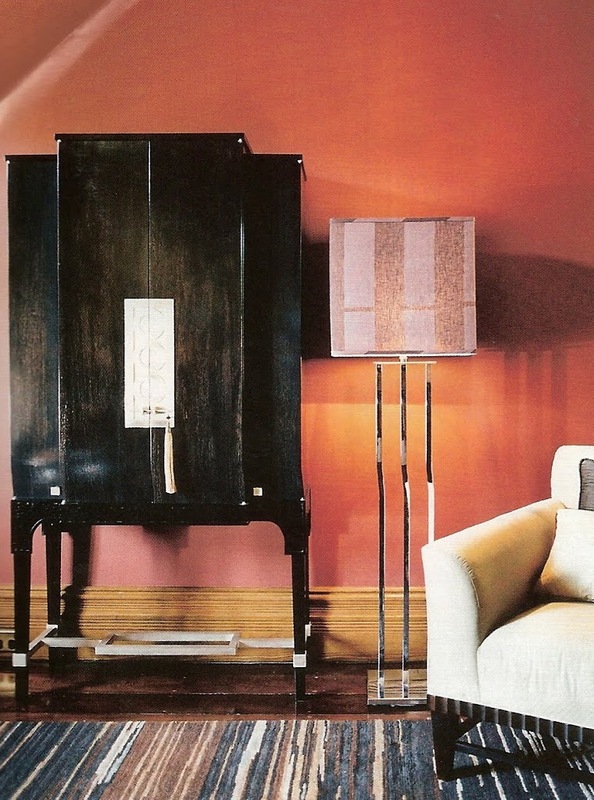 Antique Biedermeier sofa, lamp on side table from Donghia, hand-painted hanging lantern from Fortuny, Chinese screen hangs above the sofa on the red lacquered walls of the living room. Lyon designed drinks cabinet (love it), vintage floor lamp and a Barbara Barry chair in the living room. View of living room from across the dining table. 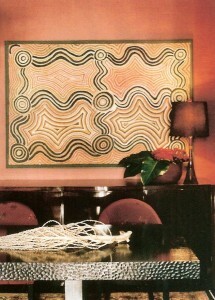 Australian aboriginal art hanging on the wall of the dining room. 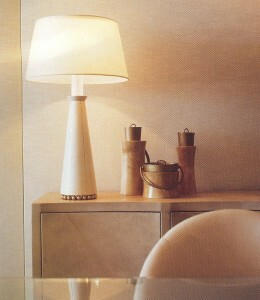 Donghia lamp sits on a 1930’s french cabinet. 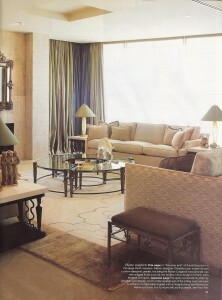 Lyon designed the table and chairs, which are covered in a Fortuny fabric. 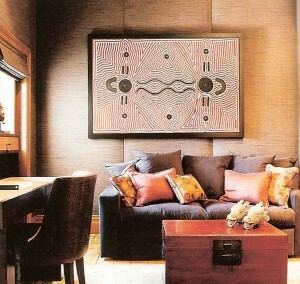 More Australian aboriginal art hangs on the walls of the study/sitting room, which are upholstered in French linen. Desk and chair designed by Lyon, chair is covered in faux croc. 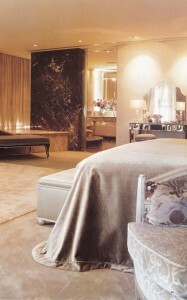 Bedroom walls are upholstered in the same French linen. Bed designed by Lyon, with Frette bedlinen. 1940’s Venetian glass lamps are from a Sydney antique dealers (how gorgeous are they!). 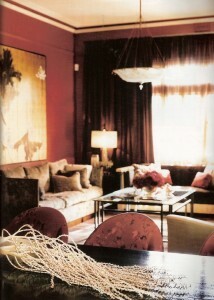 Images fromVogue Living May/June 2005.